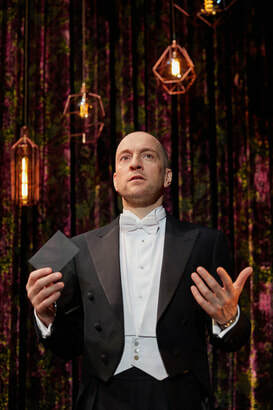 The morning after the night before and I am still wracking my brain trying to ascertain just how Derren Brown does what he does, or indeed, did what he did at the opening night of his Underground show at Southend's Cliffs Pavilion last night. There's quite clearly a very good reason why he is the multi-award winning master of mind control and psychological illusion; anyone who has seen him live on stage will no doubt confirm that he provides a fabulously convincing display of extremely mind-blowing proportions. The one thing anyone who has ever seen Derren Brown live will be asked to do, is to keep the show a secret. This is all very well and good but for those of us there who had been asked to review, well, it does makes things a trifle tricky....but, let's see just what I can tell you about the show, which will run at the Cliffs Pavilion for 5 nights this week. Anyone who hasn't seen one of Derren Brown's shows before should probably be warned that there is A LOT of audience participation and the possibility that you could end up being part of it. This is, however, somewhat reliant on a throw by Brown of a number of frisbees which, incidentally, doesn't make any difference whether you are in the stalls or the balcony because he can fling those discs with Olympian enthusiasm and frankly anyone in the theatre would be in with a chance to catch it. Not me though, or anyone I know, but anyone believing that Brown has 'plants' in the audience would, I think, have to rule this out on that basis. There are 5 secrets to be revealed in the show and Brown begins by telling us one of his. He also freely admits that this show will be full of illusions and that he will fool our minds into thinking what he wants us to think; and also, that he will lie to us at some point during the evening. He is forgiven in that he explains this doesn't make him feel too bad because at least he tells us that he's going to lie to us. The point is that we are all aware that we are being fooled by Brown but just how on this earth does he do it? Aided by dimly lit staging and at times, atmospheric music to help create an ambiance conducive to the almost supernatural occurrences happening before us, Brown talks us through each illusion and sometimes with some rather colourful language too, hence I assume the 12 plus age limit and perhaps also the fact that if anyone is up for being picked to go on stage, they need to be over 18. There are lots of opportunities for the audience to interact with Brown. Having seen Brown's last show, Miracle, I would suggest that Underground has slightly less edge but nonetheless still has the power to provide impact. Throughout the evening he reads minds and body language and uses hypnotism and powers of persuasion to create jaw dropping illusions worthy of his award winning status, resulting in a standing ovation at the shows' thought provoking conclusion. ​As always with Derren Brown, whether it's one of his tv specials or theatrical productions, I was left in complete awe of just how much time, skill and effort goes into putting on these epic shows - I just wish I could tell you more about it; but don't worry Derren, your secret's safe with me!